3, 2, 1… kiss! No matter where you choose to ring in the New Year, kissing at the stroke of midnight on New Year’s Eve has been a longstanding tradition. There are several stories behind the traditional midnight smooch, from origins in ancient Rome when the gesture was to celebrate winter festivals to English and German folklore that suggest the first person you kiss in the New Year sets the tone for the rest of the year. To get you ready for the big night, we’ve rounded up the best places in the U.S. for a New Year’s Eve kiss to ring in 2018. Happy New Year! 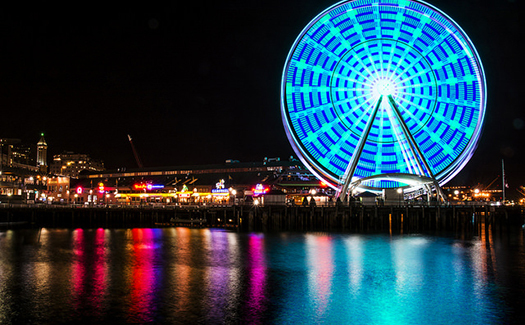 Standing 175 feet tall, the Seattle Great Wheel is the largest observation wheel on the West Coast. Perched 40 feet beyond the end of a pier over Elliott Bay, the wheel has 42 fully enclosed gondolas that seat up to eight adults on two bench seats. The Seattle Great Wheel is hosting a special Midnight Ride on New Year’s Eve, which affords a partial view of the Space Needle fireworks. Each $60 ticket includes a midnight ride (3 full rotations of the wheel), Champagne toast, photo booth photo op, party favors and a memorable way to share a smooch while soaring above Seattle. 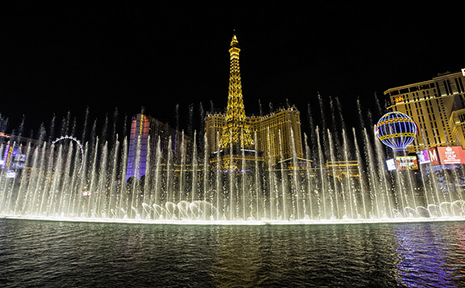 One of the most iconic shows on the Las Vegas Strip is the Fountains of Bellagio at the Bellagio Hotel and Casino. Designed by Los Angeles-based design firm WET, the water, music and light show has been mesmerizing passersby since 1998 with its flashy lights, dancing water and a rotating playlist of 30 rock, opera, classical and Broadway tunes. Why not pucker up in front of 1,200 powerful sprays of water that soar up to 460 feet? 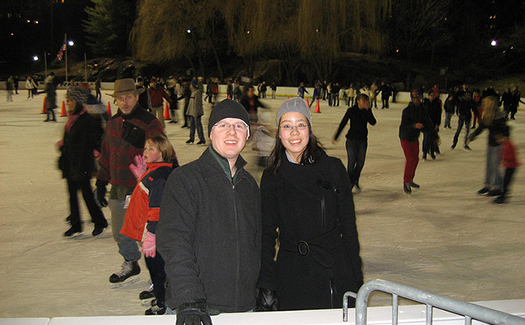 While you won’t be able to kiss on the ice at the stroke of midnight, Wollman Rink in Central Park is the perfect backdrop for a quiet New Year’s Eve kiss. Bonus: Your magical moment will include midnight fireworks courtesy of New York Road Runners’ Midnight Run, a 4-mile run through Central Park. The southernmost city in the continental U.S. has dozens of quirky options for ringing in the New Year, from a conch shell drop at Sloppy Joe’s Bar to the descent of a super-sized red high-heel shoe carrying drag queen Sushi at the Bourbon St. Pub/New Orleans House on Duval Street to the lowering of a pirate wench from atop a tall ship’s mast at the Schooner Wharf Bar. 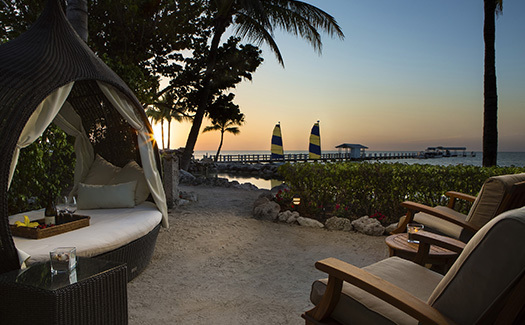 However, a more intimate way to kiss 2017 goodbye is on the private beach beneath fireworks at Cheeca Lodge & Spa, a 27-acre oceanfront 212-room estate in Islamorada in the Upper Keys. Located along picturesque Boston Harbor, Fan Pier affords an uncrowded spot to smooch your sweetie while taking in the annual midnight fireworks display. 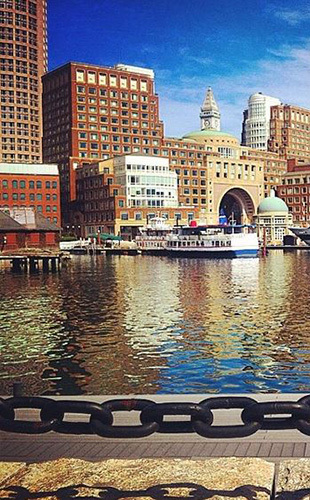 Fan Pier is part of Boston’s “new waterfront” and features trendy galleries, shops and restaurants — perfect for window shopping during the countdown to midnight. The quintessential backdrop for a romantic moment, stargazing and dreaming of the year ahead, is a magical way to start the New Year. Located between Los Angeles and Las Vegas, in the heart of Death Valley National Park, Furnace Creek Resort is a true American oasis featuring two destination experiences: the luxurious, historic, four-diamond Inn at Furnace Creek and the family-friendly Ranch at Furnace Creek. 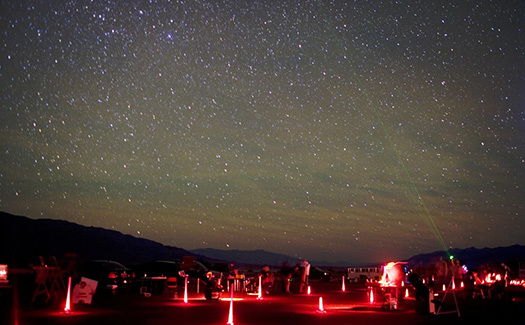 The resort is the largest (one of only 12) gold-tier-certified International Dark Sky Parks in the U.S., where stargazers can actually see the Milky Way with the naked eye in between stealing kisses before and after midnight. The Gateway Arch Riverboats, replica 19th-century paddle-wheel riverboats “Becky Thatcher” and “Tom Sawyer,” transport riders back in time to when steamboats ruled the mighty Mississippi and fueled the nation’s westward expansion. 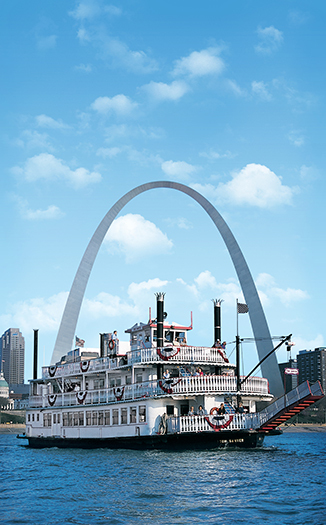 For 50 years, the boats have offered the best view of St. Louis and the Gateway Arch. They also provide a stunning backdrop for sharing kisses. A special New Year’s Eve Cruise boards at 9 p.m. and includes dinner, open bar, party favors, dancing, a live DJ and a celebratory champagne toast as the clock strikes midnight. Ease your way into 2016 by soaking in the hot springs of Truth or Consequences, New Mexico. 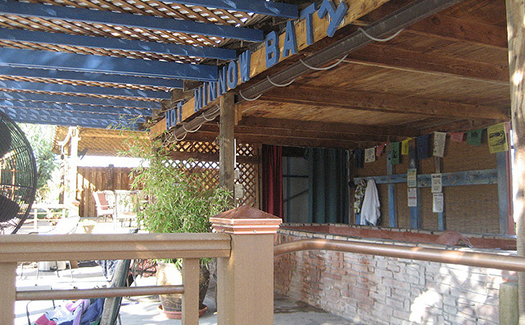 Formerly called Hot Springs, N.M., the town was renamed after the popular mid-20th century game show “Truth or Consequences.” Whether you soak for an hour or book a night at a hotel with in-room private hot springs baths, the odorless thermal springs are some of the most heavily mineralized water in the U.S., a truly therapeutic way to say hello to 2018. 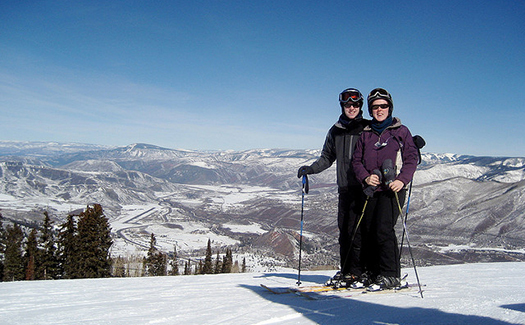 After a day of skiing on the 5,547-acres of the Aspen Snowmass, four mountains – the challenging Aspen Mountain (aka Ajax); the mixed-terrain, less-crowded Aspen Highlands with its famous Highland Bowl; beginner-friendly Buttermilk where the X Games are held; and the family-friendly Snowmass — enjoy a cuddle and kiss après ski. All four mountains are accessible with the same ski pass. 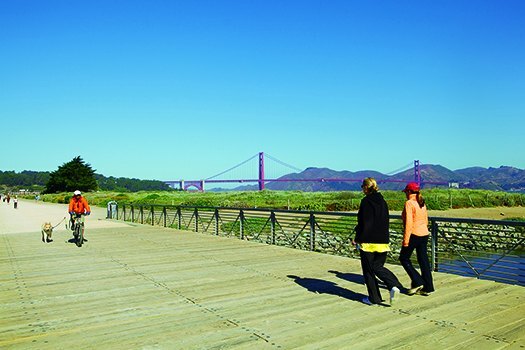 Connecting San Francisco to California’s northern counties, the orange, Art Deco Golden Gate Bridge with grand 746-foot tall towers, attracts more than 10 million visitors each year. Cyclists are granted overnight access on the east sidewalk via remote-controlled security gates located on both ends of the east sidewalk. Grab a bicycle built for two and share a smooch on the bridge. Part of the 250-acre urban green space of White River State Park in downtown Indianapolis, The White River Canal features a 3-mile walk along the canal. 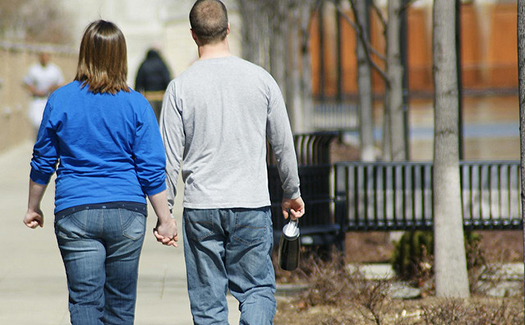 Stroll hand-in-hand with your love taking in sites like the Congressional Medal of Honor memorial, a 9/11 Memorial, large-scale mastodon sculptures and 10 murals that were installed in honor of the city’s hosting of the Super Bowl in 2012. The peaceful walk is the perfect place to steal pecks prior to a big kiss at midnight. 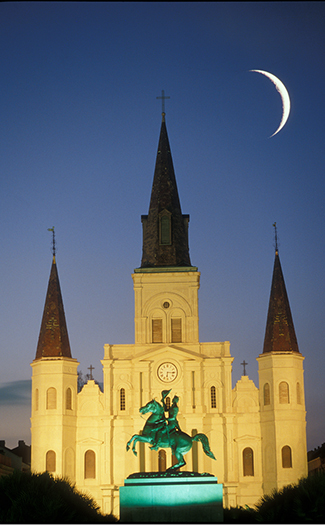 Located between the banks of the mighty Mississippi River and the iconic St. Louis Cathedral and Jackson Square, Washington Artillery Park is a postcard perfect spot to share kisses. The slightly elevated space offers beautiful views of the French Quarter and is a prime spot for the fireworks show following the Fleur de Lis drop at Jax Brewery. When you’re done celebrating with your sweetie, saunter down to the famous Café du Monde to enjoy something just as sweet — beignets. Mackinac Island, a 3.8-square-mile island on Lake Huron between Michigan’s upper and lower peninsulas, is a memorable place to ring in the New Year for those who love fresh, brisk air and peace and quiet. And the ideal spot for a kiss? 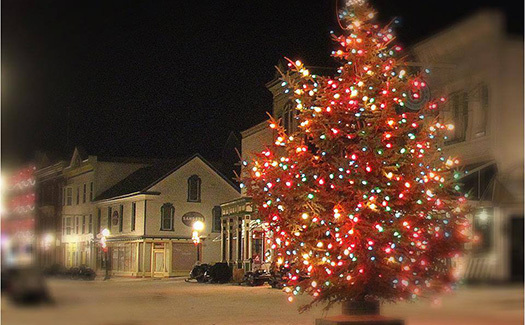 Beneath the sparkling lights of the 40-foot Mackinac Island Christmas tree in the car-less downtown. By the Jefferson Memorial in Washington, D.C. The nation’s majestic monuments are beautifully lit at night, providing pretty pictures and the best place to share kisses to ring in 2016. 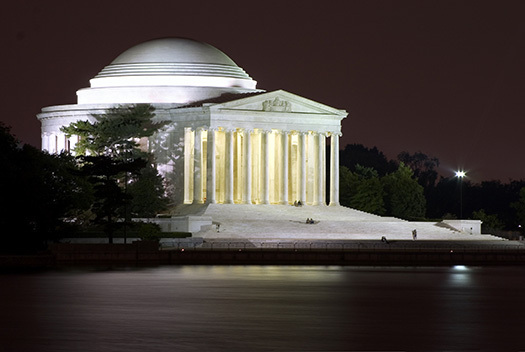 The Jefferson Memorial, dedicated to the author of the “Declaration of Independence,” is a local favorite. End 2017 and begin 2018 with a road trip on iconic Route 66. Dubbed “The Main Street of America,” Route 66 cuts a diagonal route through eight states, from Chicago to Los Angeles. 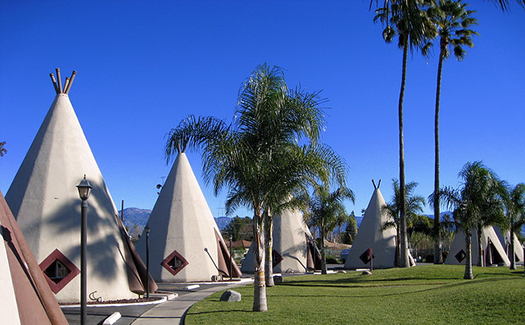 There’s a motley collection of curiosities to see along “The Mother Road” which was immortalized in John Steinbeck’s classic “The Grapes of Wrath.” Stay in the iconic teepee-shaped cabins at Wigwam Village #7 in San Bernardino, Calif., a quirky way to ring in 2018. The skies above Waikiki Beach on Oahu are lit up with color during the annual fireworks celebration that happens on New Year’s Eve. 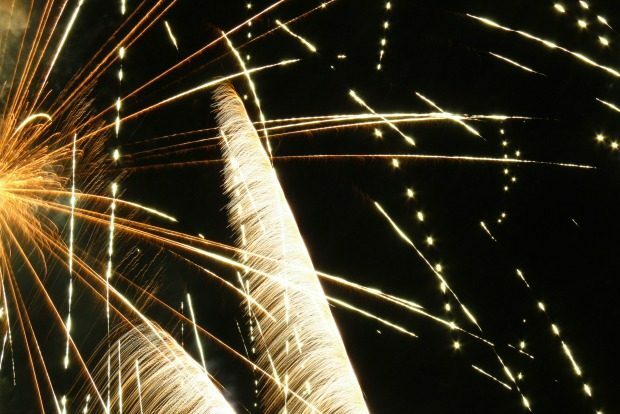 Beginning at 11:55 p.m., expect one firework salute each minute until one minute before midnight. At the stroke of 12, more than 1,800 fireworks launch into the night sky during the 10-minute show. Tune your radio to Country 97.5 or 107.9 Hawaii’s Kool Gold for perfectly choreographed music. Share a pair of headphones with that special someone and enjoy a private moment as the clock strikes midnight. Where will you be ringing in the new year? Share with us in the comments and make a New Year’s Resolution to travel more in 2018. You can start your flight search on Cheapflights.com.